GMC recently unveiled their special edition model GMC Sierra All Terrain X 2016 in Texas at the 2016 Houston Auto Show. The special edition truck gets some remarkable off road capabilities with that dynamic body and comfortable interior. 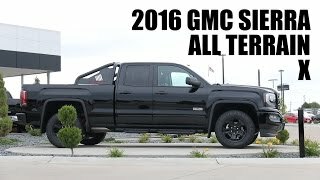 Let us have a look at the review of GMC Sierra All Terrain X 2016 to know in detail about it. The interior of GMC Sierra All Terrain X 2016 doesn’t brings enough changes with it, however those integrated are sufficient to narrate the ‘special edition saga’. The changes made in the cabin primarily include a specially crafted gauge cluster, floor liners and inclinometer function that carry the ‘All Terrain’ over them. Apart from these rest everything inside remain almost similar. The spacious interior comes with sufficient house for six people and has plenty of storage spots for your stuffs. Talking about tech integrations it has a 4.2 inch TFT screen in the gauge cluster featuring vital information while an eight-inch infotainment while the 4G LTE Wi-Fi and SiriusXM satellite radio will keep you connected with world. There are also 12-volt outlets and a 110-volt outlet to charge your device. 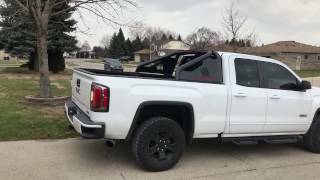 Thus rounding up the interior details of GMC Sierra All Terrain X 2016 I would say it has sufficient features to make your ride comfortable and memorable. Talking about the exterior of GMC Sierra All Terrain X 2016 we have some sporty inclusions in our list. Starting with the front fascia, the model comes with bespoke grille surrounded by tinted chrome and body-color accents. Looking from side you’ll notice the blacked out Goodyear Wrangler DuraTrac MT tires. The wheels impeccable add to the off-road glory of the model and provide better grip and performance. You’ll also notice the ‘Sports Bar’ with two LED light bars. The latter not only adds to look but will also be of help during the nighttime. Apart from these company focused over providing high-end inclusions that will provide better performance. 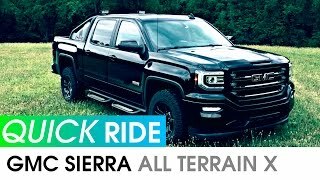 Thus rounding up the exterior details of GMC Sierra All Terrain X 2016 I would say it has the looks that commendably narrate the off-road sportive saga it carries. 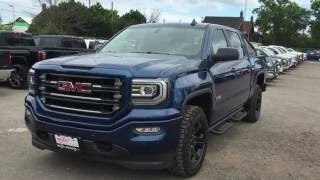 Beneath the hood of GMC Sierra All Terrain X 2016 comes a 5.3 liter EcoTec3 V8 engine producing total output of 355 hp and peak torque of 520 nm mating to six-speed automatic transmission and a two-speed electronically operated transfer case. 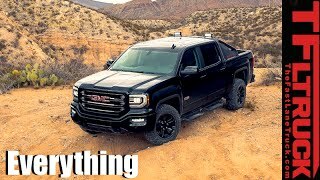 The performance figures of GMC Sierra All Terrain X 2016 are still not shared but looking at its off-road capabilities like the Z71 suspension package, 4WD terrain and more, you can expect a good rumble.